By: Matthew Flores, Gr. 10 – Bl. Julian Nakaura, S.J. A powerful line said during Ms. Susan Quimpo’s talk on Martial Law last Tuesday, September 20 at the XSN Multi Purpose Centre. Ms. Susan Quimpo, a woman who lived through the Marcos regime, shared with us the experience of how life was during this time. She gave a different kind of talk by having a more personal perspective on one of the darkest times in Philippine history. The abuse, the maltreatment, and the disrespect of human life and dignity upon our own fellow Filipinos–almost unfathomable. 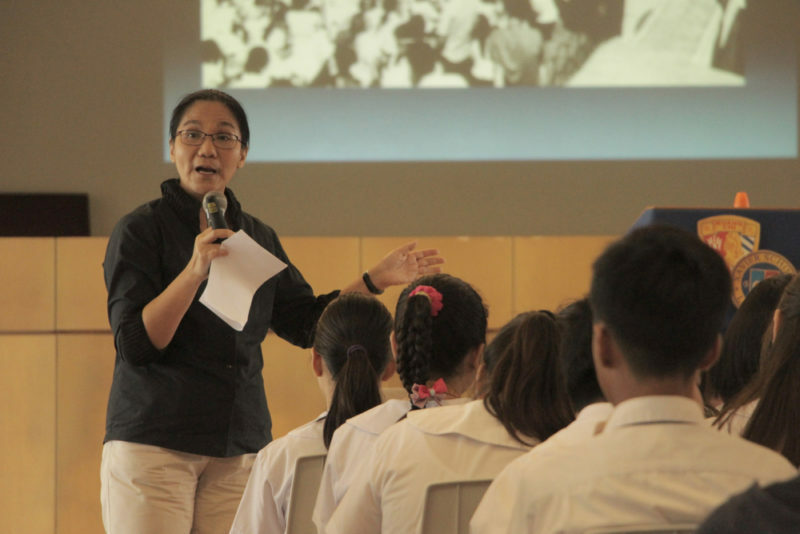 The talk was held for the Grades 7 to 11 in hopes of raising awareness of the truth of what really happened during Martial Law so that the students can be inspired to be more socially active and spark change. Her talk, unlike most Martial Law talks, had a different perspective. It centred not so much on Marcos and the Aquinos; instead, it was centered on the students, the youth of this time. She started by talking about how there was already aggression against the Marcos administration even before Martial Law. According to her, most, if not all, rallies were led by students. She explained how a lot of them–some even our age–attended these rallies. With her words, she painted a picture of a passionate, selfless, and brave generation of young people who were committed to social change. The second part of her talk was about Martial Law itself and especially the atrocities committed to the Filipinos during this time by the government. Ms. Susan Quimpo shared with us the absurd reasons for detainment during the suspension writ of habeas corpus under the Martial Law, of how just by having glasses, a UP ID card, and looking Chinese, you can already be suspected of being a communist and/or a rebel against the government. That by being a student leader, a student writer (oh my), or just plain smart, it was enough to take you away from your families and subject you to torture. And that wasn’t all. She explained, in quite a lot of detail, the various methods of torture and the stories of people during their imprisonment. People our age, my age, being tortured and treated like animals- even worse than animals in fact. It was horrific to imagine. The heart of her talk was when she talked about her brother. Martial Law became real to all of us audience members because this was her brother she was talking about. Someone she knew. This wasn’t some story she learned from a textbook, or something she heard from a friend. This was her brother, someone with whom she grew up. Her brother, who, just by having glasses, a UP ID card, and looking Chinese, was abducted by the military in his friend’s house. She told in great detail the story the torture her brother had to endure for 5 months. Torture that included, but was not limited to, live wire electrocution, beatings, and much more. He underwent 5 months of not only physical torture, but psychological as well. He was traumatized so much that even when her brother came home after being released, they would hear him screaming and shouting in the middle of the night because of the nightmares caused by his Post-Traumatic Stress Disorder (PTSD). This was the experience of her brother, who was older than us by only a few years. As someone in the same age group, I am compelled to ask myself, could I endure what her brother endured? Personally, I’ve always hated Martial Law. I couldn’t imagine how a leader would be able to be so cruel to the very people he had sworn to protect. At an early age, I was able to gather a substantial amount of knowledge regarding the whole period. Important facts such as when it started (September 21, 1972), who called for it (Ferdinand Marcos), even the proclamation number (Proclamation No. 1081). And that’s what I thought the talk was going to be about. Just a simple “who, what, when.” Marcos. Aquino. EDSA. The “usual” topics we hear when it comes to Martial Law talks. But that’s where her twist came in. When she talked about the students, it felt more realistic. The story of Martial Law felt less like an abstract concept. It wasn’t difficult to picture myself in their shoes, because these people were as old as I am today. I believe what made the talk most memorable were 2 things: the fact that these were personal stories, and how her stories were about students. The stories she told were people she knew: her brothers, her sister, her friends. The stories didn’t come from a book, not something that she just read. Her stories came from her family and friends. They came from her heart. In front of us was someone who lived during the time. She might have not been tortured herself (thank God), but it didn’t diminish the impact of her stories. We are reminded that Martial Law isn’t some abstract event; it really happened. Real people were killed. Real Filipinos–brothers, sisters, fathers, mothers, and friends. All of them lost to the brutalities during Martial Law. What was more horrifying to me is that a lot of the victims were also students–people my age fighting for our nation’s freedom. And to me, that’s surprising. I can’t imagine the youth today doing such things. Not putting my generation down, but the amount of commitment and patriotism that was displayed by the students back then isn’t something we often see today, not even in our daily lives. Overall, I truly appreciated the entire event. It was good exposure for me and the rest of the study body to the Martial Law era. I really felt Ms. Quimpo’s sincerity in reaching out to us youth. Looking back, I realized how strong of a woman she must be. I can’t imagine how hard it must be for her to share these stories with students, with strangers. 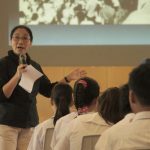 Despite the difficultly in doing so, she still continues to do talks in schools and universities. Why? Because that’s how much she cares. It is her way of commemorating the memory of her lost loved ones, and more importantly, this is her way of ensuring that events like these, times like Martial Law, aren’t repeated. After the talk, I was compelled to ask myself, “What am I called to do? What do I do now?” I believe the best way we can properly honor the Martial Law victims is by making sure it doesn’t happen again. Unlike many Marcos apologists, our only source of Martial Law shouldn’t just be Facebook memes. Right now, as high school students, there is admittedly a limited number of things we can do. I myself wondered on what we can do given the limitations we have. According to Ms. Quimpo, the best thing to do would be to educate ourselves, and fight the trolls. By educating ourselves, not only do we honor the lives lost to Martial Law, we also prepare ourselves for college. Once in college, we are given a louder voice to share our opinions and more freedom to fight for what we believe in. Educating ourselves doesn’t just mean we know about Martial Law, but we know the truth behind it, the stories, the lives of people in what was without a doubt one of the darkest times in Philippine history. We also need to fight the trolls. For those unfamiliar, “trolls” refer to the people online who leave offensive and inflammatory comments on posts and/or spread lies online. An example of trolls would be those who say, “Martial Law was only declared because there was a great communist threat.” Now we know that to be false because according to Ms. Quimpo and her research, there were only 600 reported communists at the beginning of Martial Law, but by the end of this era, the number had ballooned to around 20,000. When Ms. Quimpo said “fight the trolls,” she meant to reply to them in an effort to correct the false information and fallacies that they spread. I believe that this is a good place to start as a high school student. If these trolls can comment on posts and share lies online so that people will be fooled, why can’t we reply with the truth? If we allow these trolls to continue posting and commenting, people would just think these trolls are saying the truth. I asked Ms. Quimpo on sites which have credible sources regarding Martial Law so that we have a good source to cite our comments on, and she recommended sites such as Bantayog ng Mga Bayani and The Martial Law Chronicles Project, which contain stories of and during the Martial Law. I feel that we are all compelled to become a more socially aware community, to see the parallelism between then and today. After knowing more about Martial Law, I can’t help but see the eerie similarities today such as the deaths, the extrajudicial killings. It seems as though through the 44 years, all we’ve done is replace the word “communist” to “drug pusher.” Like before, there is a dehumanisation of people. Aside from that, our current State of Lawlessness feels like just one step away from a suspension of the writ of habeas corpus. However, we must not end with being just socially aware. Awareness may be the key to change, but it is only when we move our hands can the lock be opened. The talk inspires us to take action and fight for what we believe in. Despite the challenges we face, we should always strive for truth and justice.